FlareAdvisor: A new way to track and manage Flaring and Venting emissions and identify opportunities to reduce emissions. Pressure safety valves (PSVs) on vessels containing liquid hydrocarbon may relieve a supercritical fluid during a fire, if the relieving pressure is higher than the critical point. The typical method for sizing an orifice area for supercritical fluids is presented in API 521, Section 4.4.13.2.4.3 . As stated in the API text, this method is based on the physical properties of air, the ideal-gas law, no change in fluid temperature, and an uninsulated vessel with no mass. This standard cautions the reader to review these assumptions to ensure that they are appropriate for any particular case. 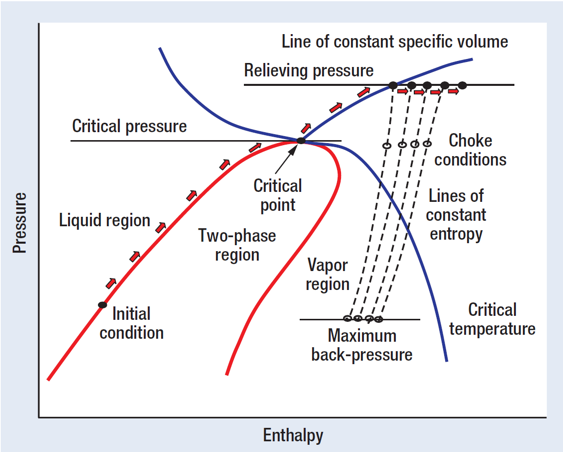 Supercritical fluids exhibit characteristics of both liquids and vapours and their physical properties can be strong functions of pressure and temperature and may deviate appreciably from ideal-gas behaviour. These deviations from both ideal-gas law and incompressible fluid behaviour present challenges for relief valve sizing. Furthermore, the compressibility factor and the fluid temperature are not constant while the vessel is relieving. The API-recommended method with ideal-gas behaviour simplification is conservative and may lead to improperly sized valves with larger orifice areas than required , . Two main problems with over-sized valves are destructive chattering and cost. Process Ecology displayed FlareAdvisor at the Natural Gas Star Implementation Workshop in Pittsburgh, PA describing the value of the software for tracking and reporting flared and vented volumes. The USEPA Workshop showcased a number of technologies for methane emissions reduction. A new paper with contributions from the University of Calgary and Process Ecology has been published in the Journal for Applied Thermal Engineering 87 (2015) 788-802 . "Evaluation of energy efficiency options in steam assisted gravity drainage oil sands surface facilities via process integration ". Access the paper at Applied Thermal Engineering.